While we make various versions of the "Indian Sandwich", this is one method of preparation contributed by my guest host - Cinnamon. It's a tasty roadside snack which is very simple and easy to make. 1. 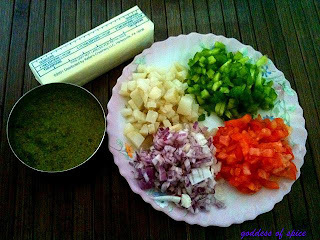 Mix all the veggies, salt and black pepper powder. 2. Take two slices of bread. Trim them on edges. On one slice, apply butter on both the sides. On the other slice, apply butter on one side and chutney on the other. 3. 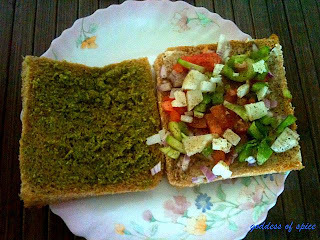 Put the mix vegetables on one side of the bread that has butter on both the sides. Cover it with the chutney slice. 4. Place it in a grill sandwich toaster till it turns brown and crisp on both sides. 5. Take it out and cut diagonally. 6. 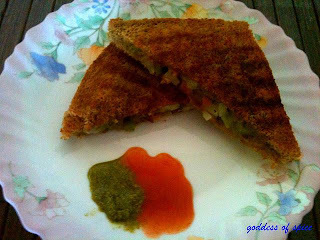 Serve hot with chutney and ketchup.